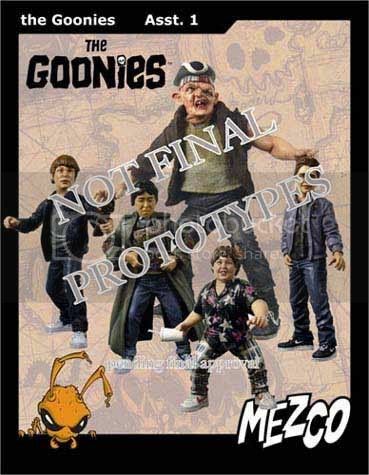 I definitely don't need another toy line to tempt me this year, but it sounds like Goonies action figures are on the way from Mezco. 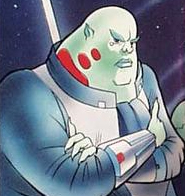 It is said that they will be 7" scale, and the first wave will consist of Mikey, Mouth, Chunk, Data, and Sloth. More info at the link. The ablity to speak does not make you intelligent - now get out of here! No kidding on another line to be collecting...but this one is a must have for my family!!! This is one of the few movies that my wife and I can agree on watching together no matter what mood we are in. Saw those at the Mezco showroom today. Pretty cool that the movie is *finally* getting represented in action figure form. They'll be in the stylized method that Mezco often uses, but they really look pretty cool. I'll probably end up picking these buggers up. A cool variant for the Chuck would be with him doing the truffle shuffle!!! I think this is awesome and gives me hope that there will one day be Spaceballs figures. I probably won't buy these though. Yeah i saw those. I wish i knew or had connections to buy some of those things. That would be awesome. I wonder how much they cost him. Just curious, did anyone end up picking up any of these Goonies figures? I have to admit I was tempted, as I was/am a big fan of the movie, but this ended up being such an expensive year for Star Wars so I had to pass. Just wondering how these figures turned out, if anyone got them. I saw them at hot topic and wasnt too crazy about them. I love the movie but couldnt justify buying the figures especially after seeing them.